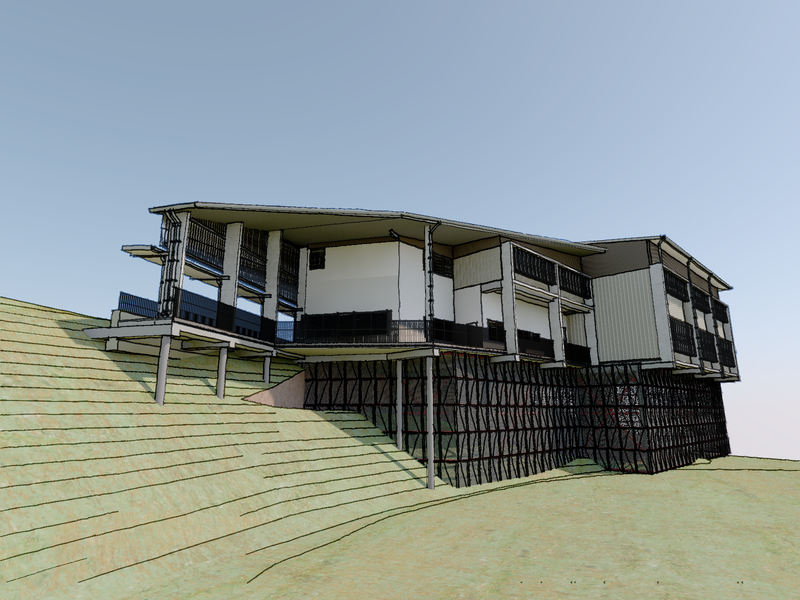 [15.04.2019] Centenary Heights Performing Arts Centre renders. 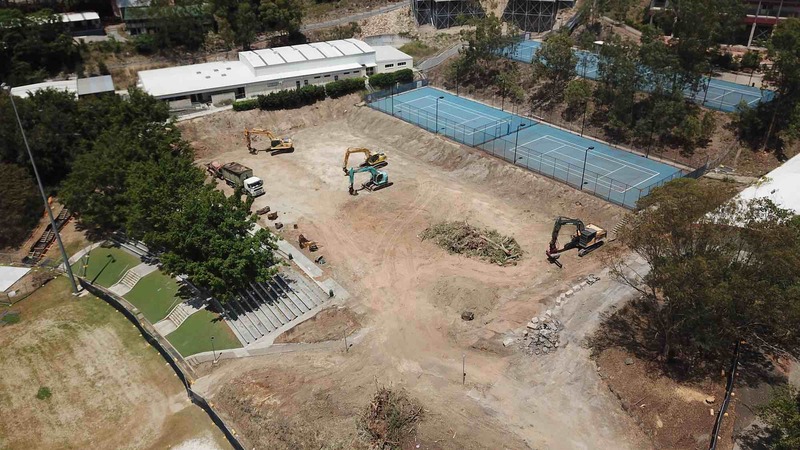 [21.03.2019] Construction has started on the new Performing Arts Centre at Centenary Heights State High School. 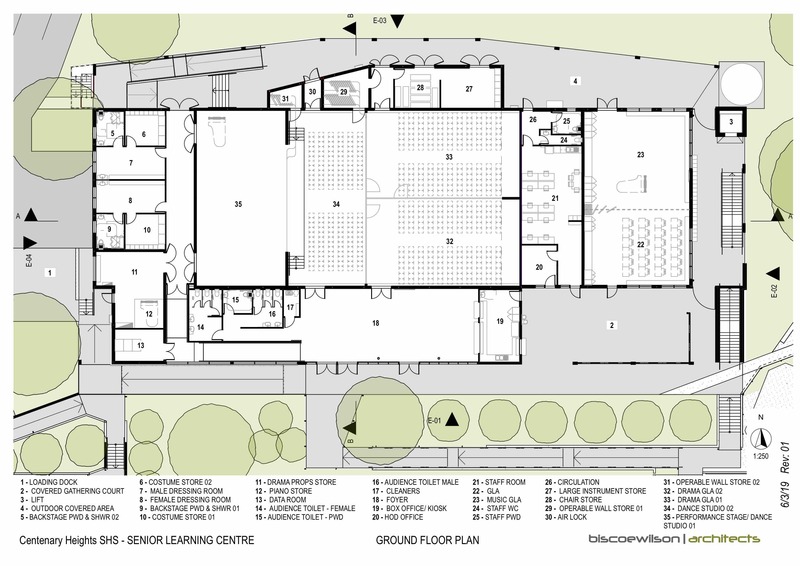 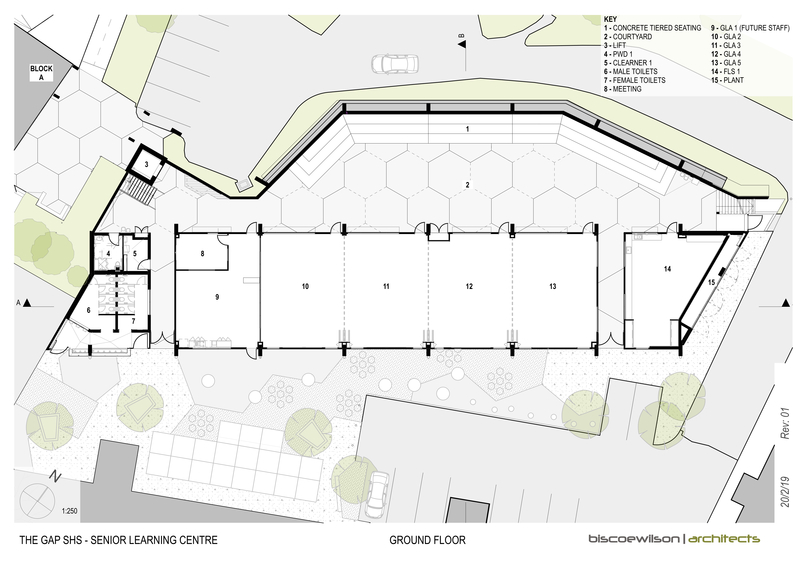 Biscoe Wilson Architects were engaged by the Department of Education to design and document the new Performing Arts Centre (PAC) at Centenary Heights, and the refurbishments to Centenary Heights’ existing art rooms and the senior hospitality building. 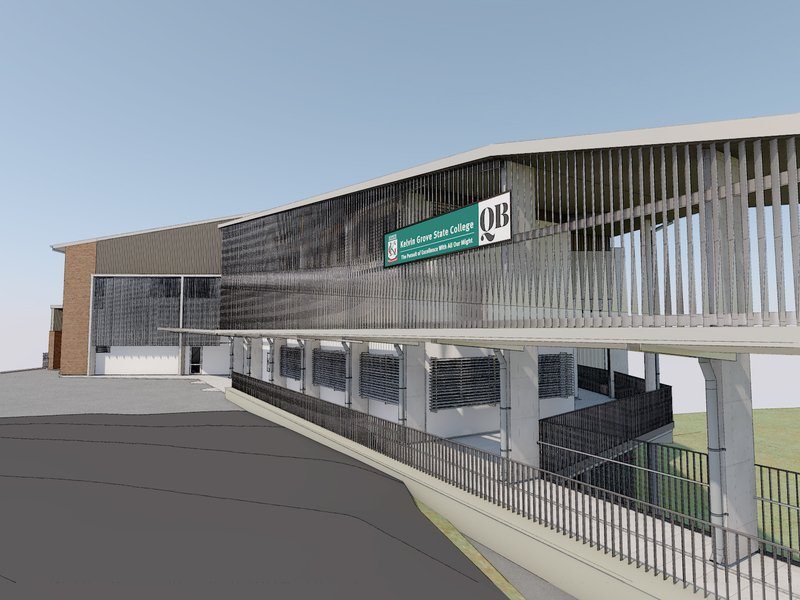 Together, this will provide for the increased capacity needed for Centenary Heights in 2020. 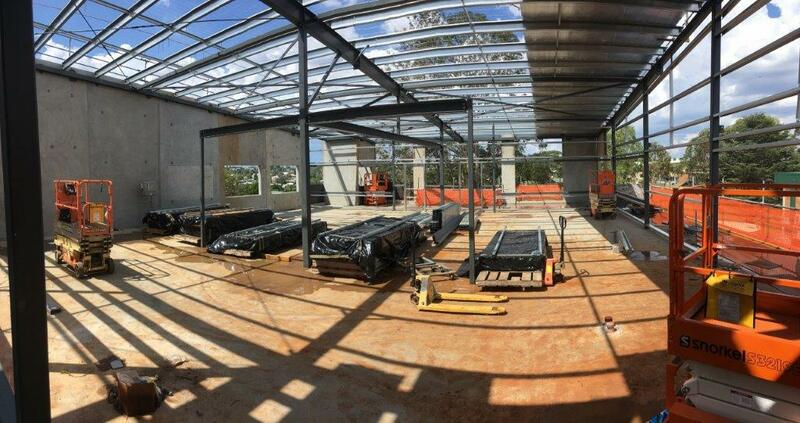 We worked closely with Farr Engineers to develop a structural system that would enable fast construction. 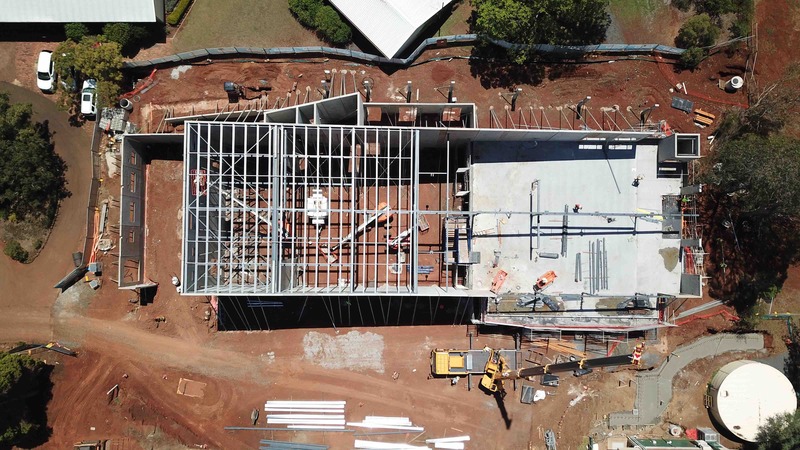 The post tensioned concrete suspended floors and precast concrete walls enable the main structure to be erected with minimal disruption to the school. 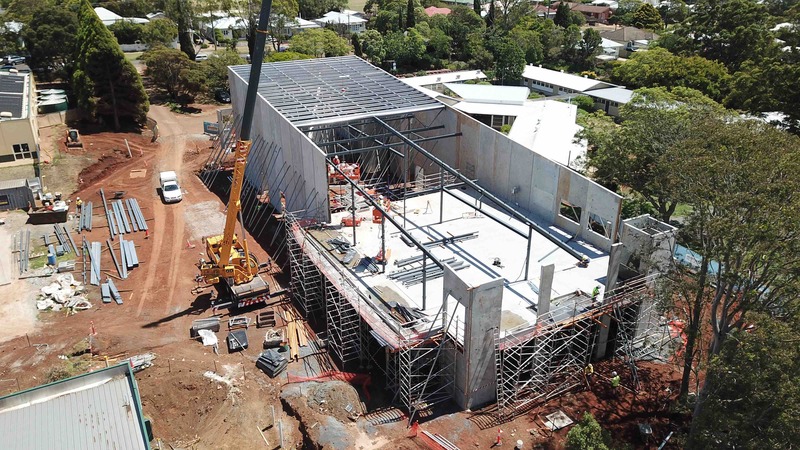 [11.03.2019] The precast walls have ensured that the new PAC at Centenary Heights has taken shape quickly. 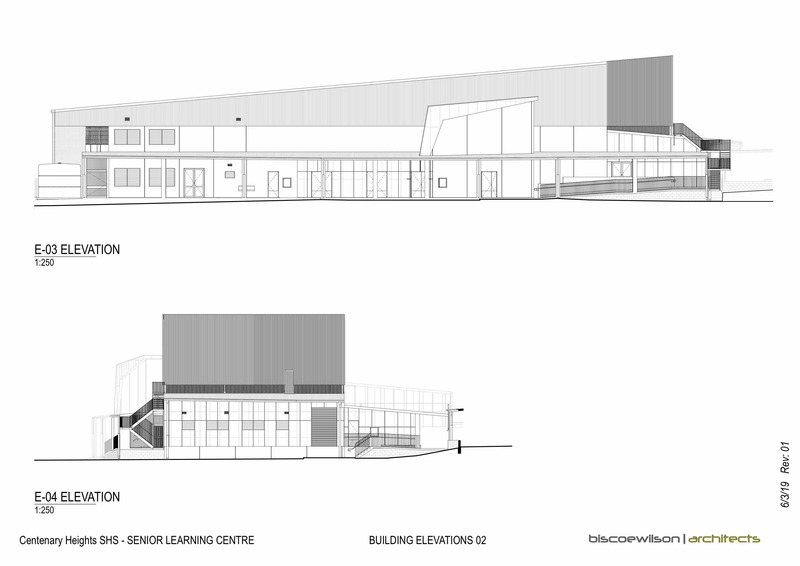 The new PAC building is located centrally to the school and accessed directly from Ramsay Street. 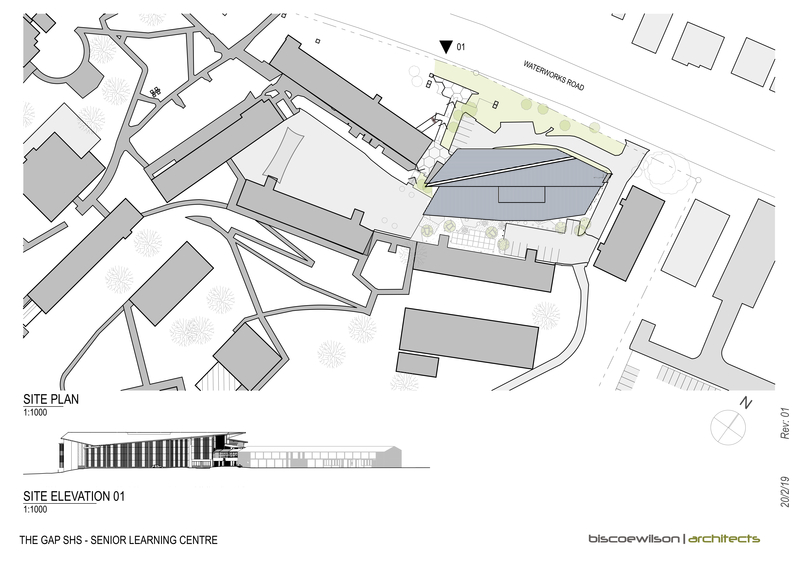 The Performing Arts Centre provides specialised spaces for dance, drama, music and film, bringing together a holistic concert of self-expression and art to support and enhance one-another. 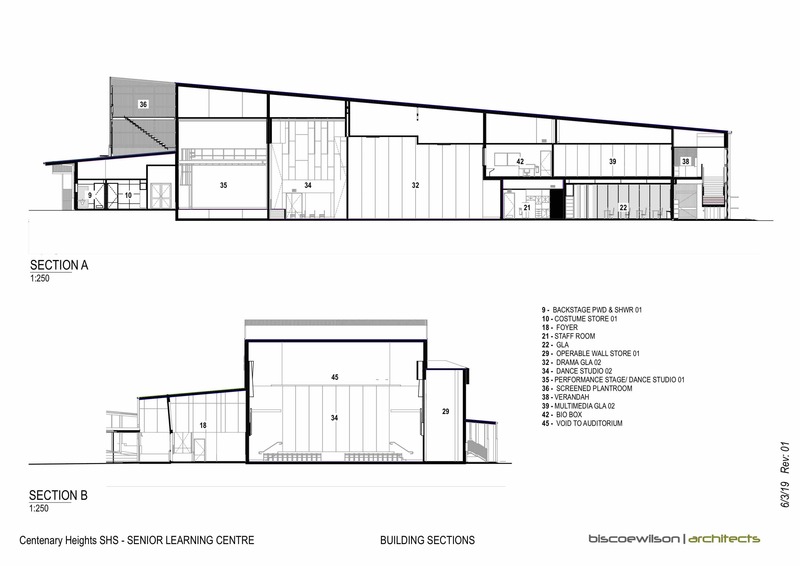 Internally, the design provides flexibility for teaching and performing drama and dance. 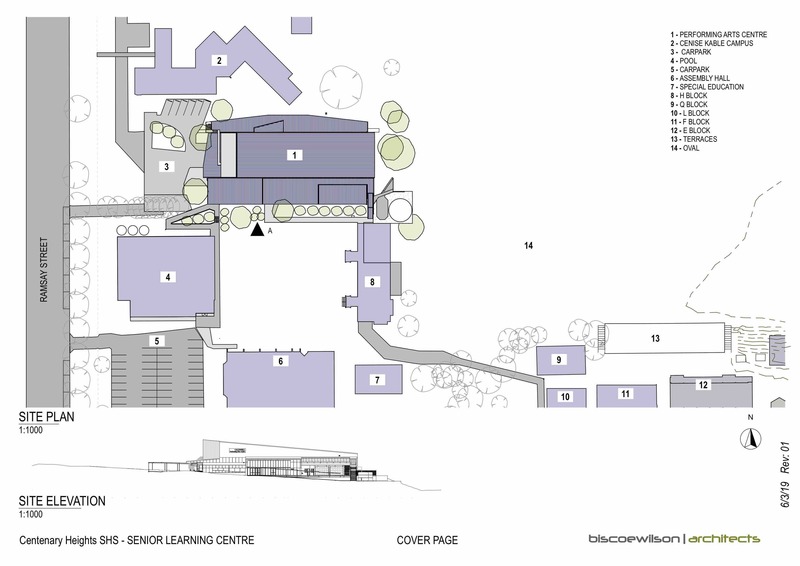 The stage area can be divided into separate teaching areas, or opened with operable walls into a single large stage and seating area suitable for a 300 person audience. 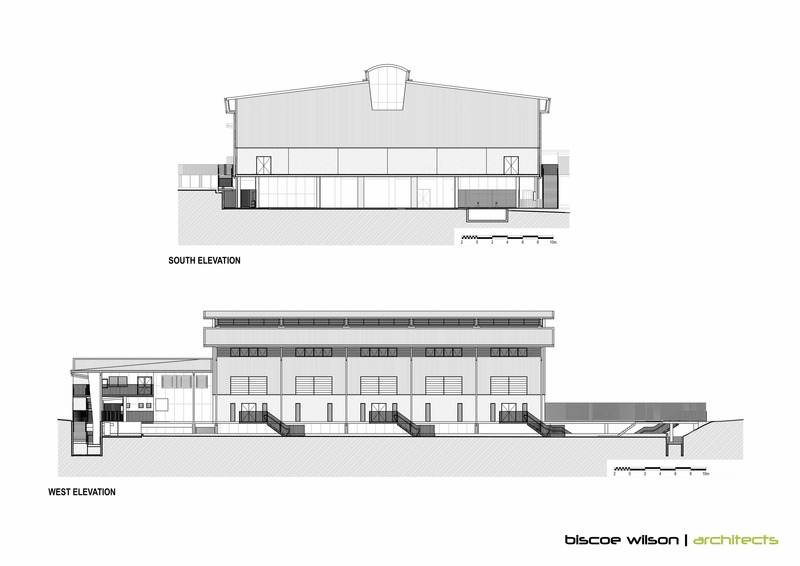 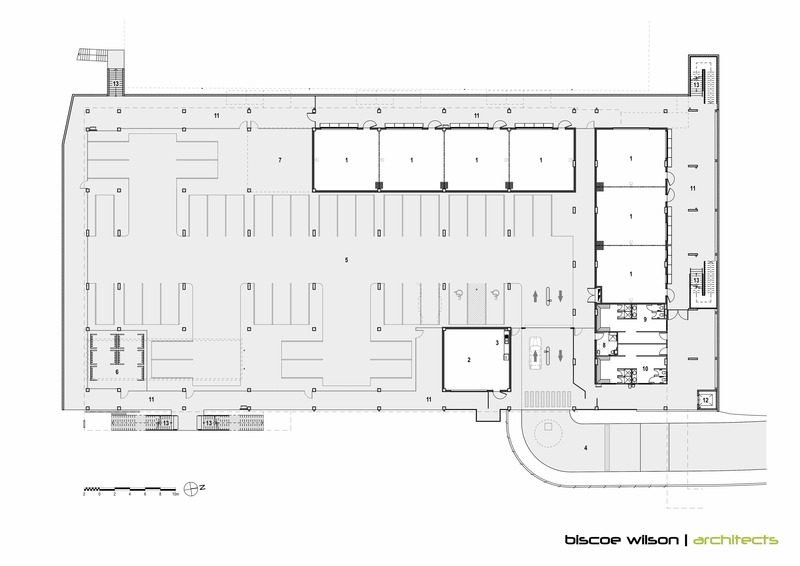 The stage is facilitated by the backstage, loading dock, change rooms, ample storage, retractable seating and bio box. 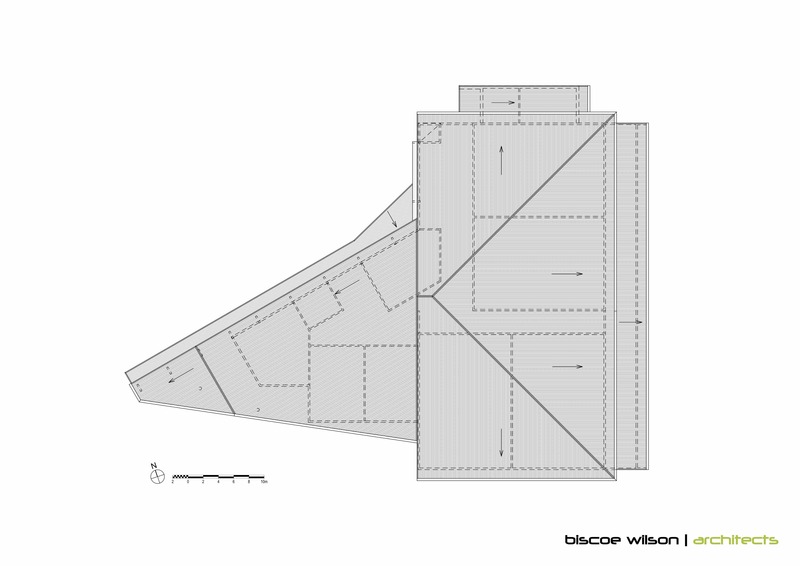 The wedge spaced section provides an increased height over the stage to cater for stage lighting, curtains, props and mechanical ductwork. 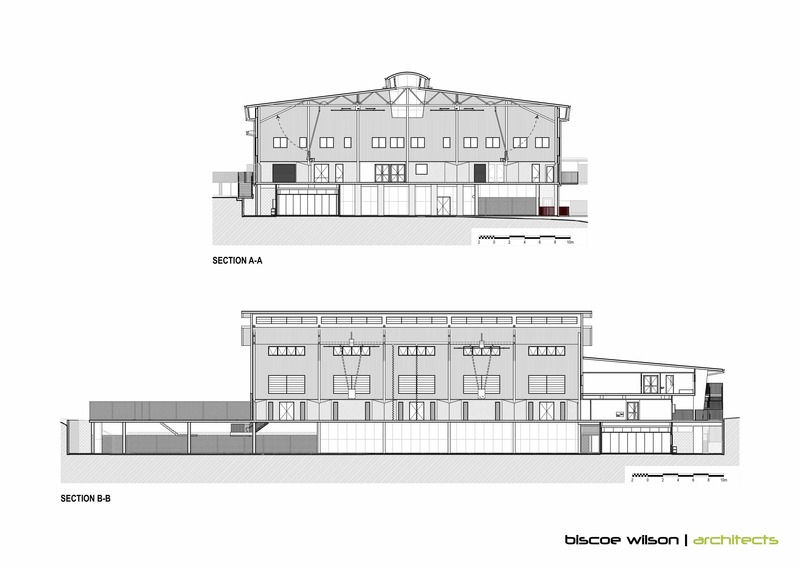 Ceiling heights ranging from 7 to 10m provide opportunities for more dramatic spaces and proper theatre lighting. 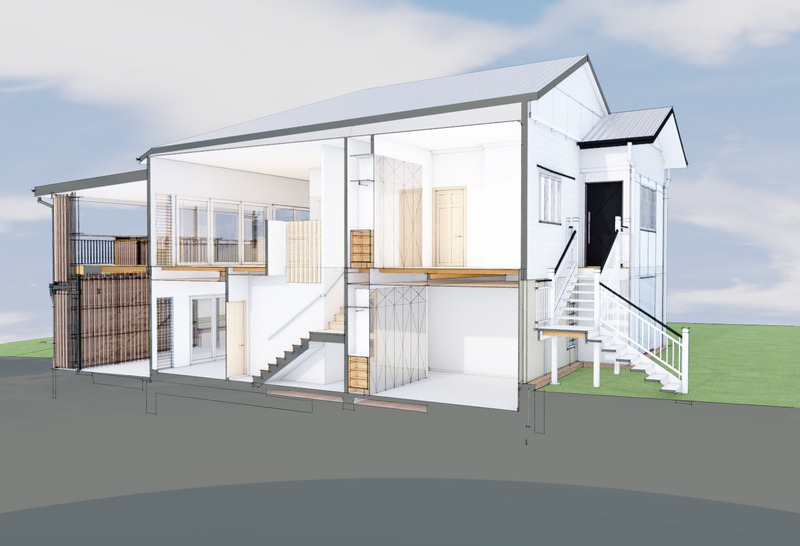 A front of house foyer with servery, amenities and outdoor foyer provides a welcoming entry and alternative function space. 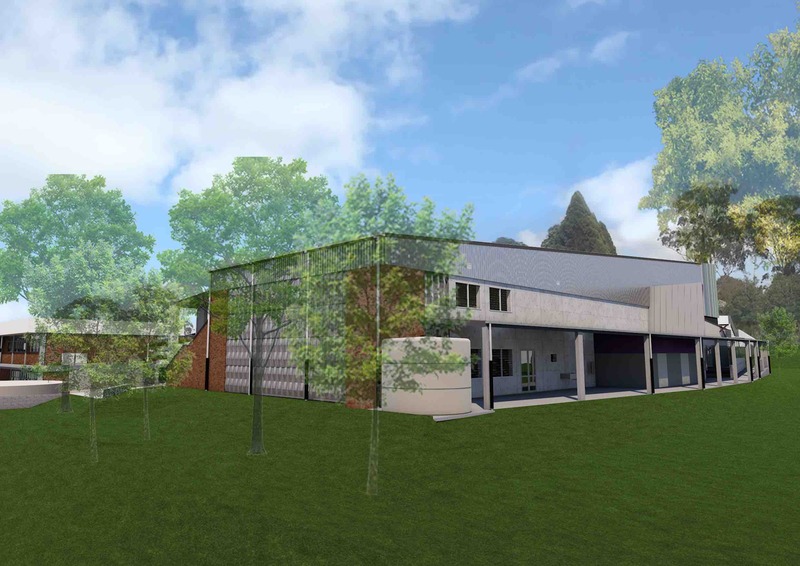 Additionally, this new building provides a Head of Department office and staff rooms, two music rehearsal rooms, and upstairs a bio box, green room, digital equipment store and general learning areas. 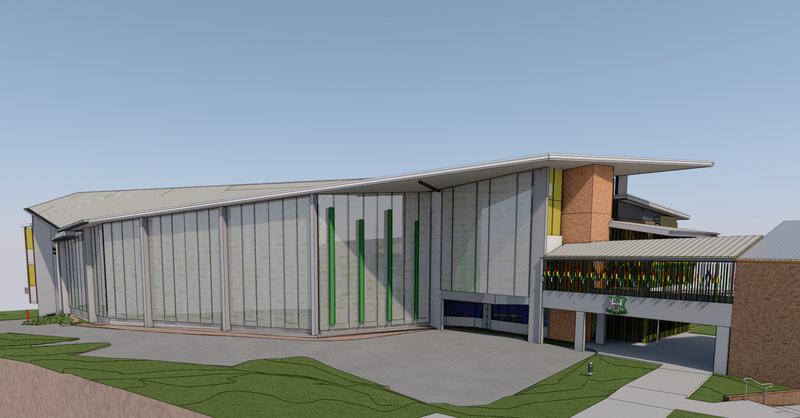 Concept images for the new Performing Arts Centre for Centenary Heights State High School. 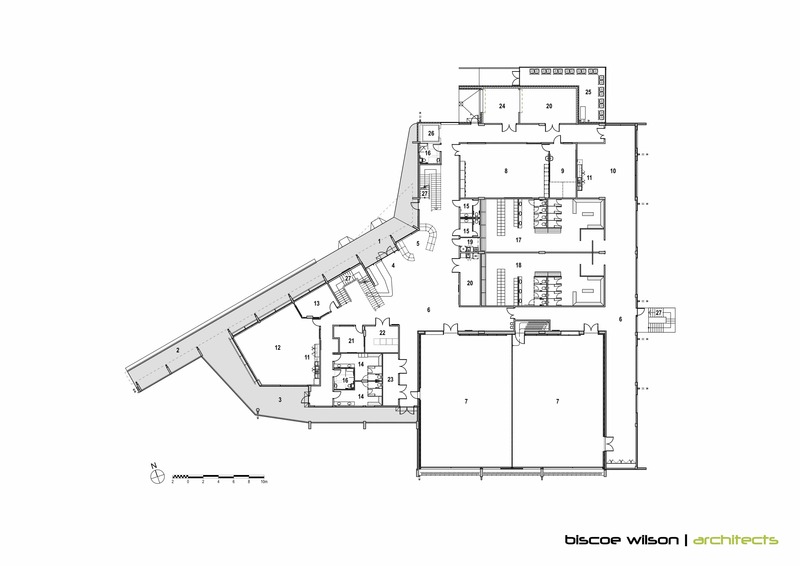 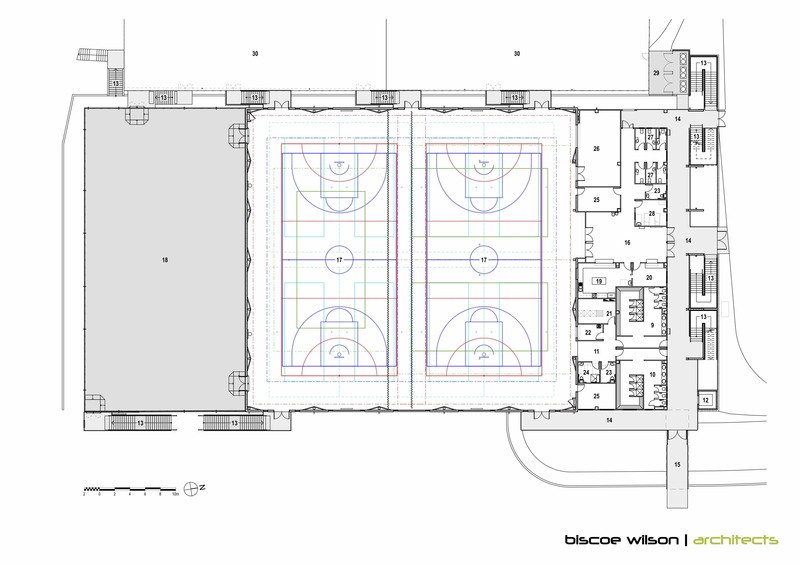 Biscoe Wilson Architects assembled a specialist design team to insure that the PAC was designed for longevity, and would satisfy the various needs of the school and the community. 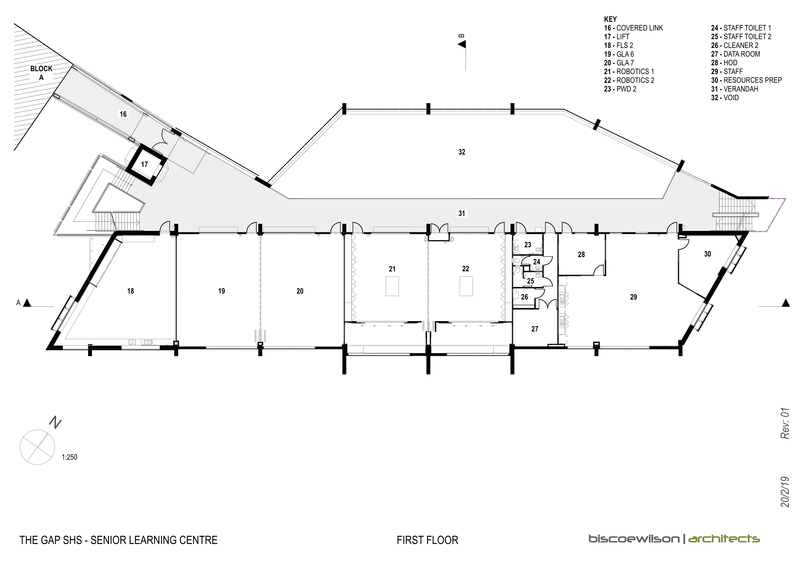 This team included acoustic consultants, Acoustics Noise Vibration (ANV), and specialist theatre consultant, Design Stage. 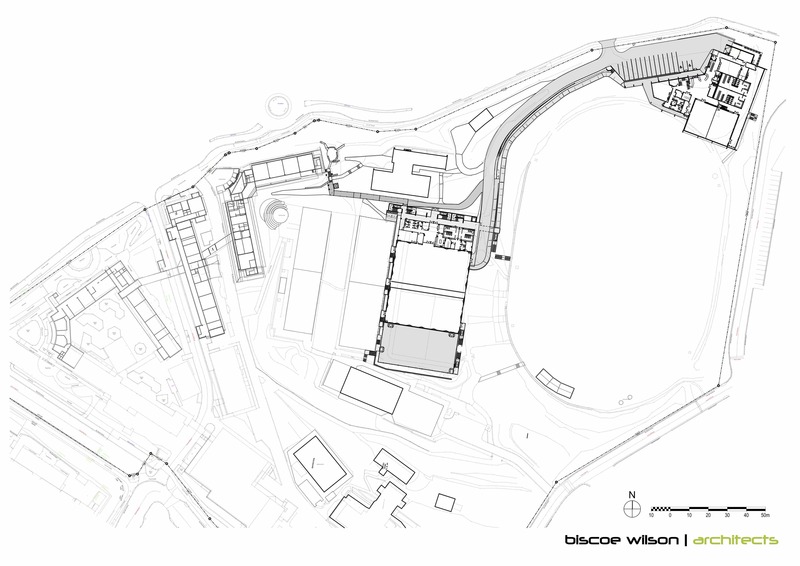 Our specialised team of consultants, aided by 3D computer modelling, enabled the understanding and control of sight-lines and acoustics, enhancing the opportunities for performances. 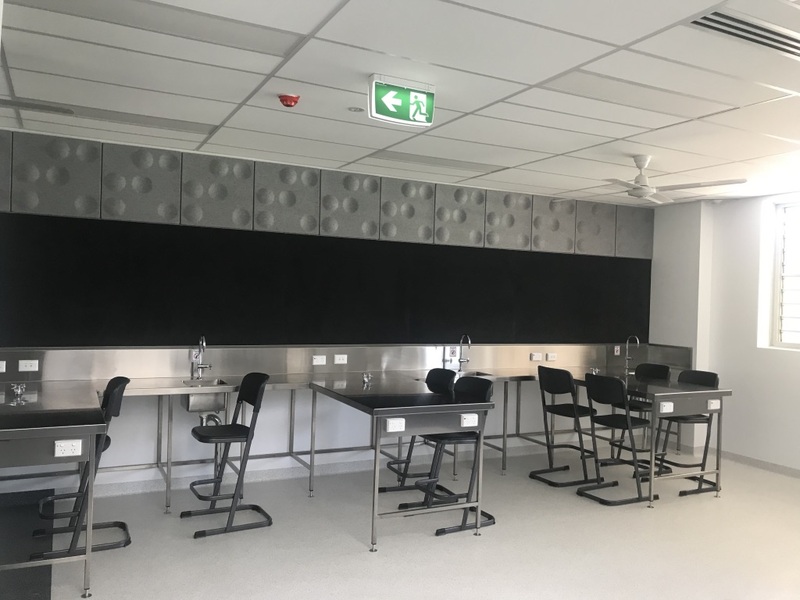 The Queensland Department of Education are dedicated to providing wonderful teaching facilities that support staff and students in a variety of curriculum areas. 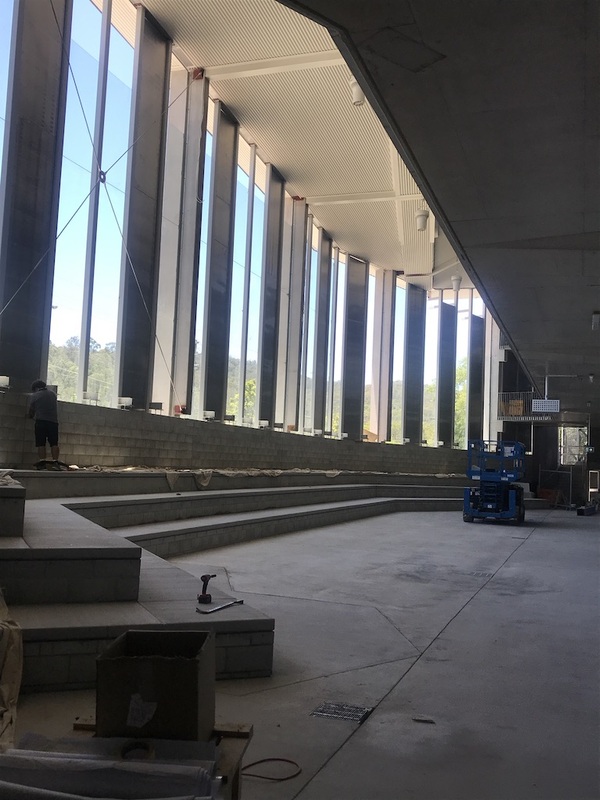 Buildings such as the new PAC at Centenary Heights are also invaluable for wider school and community functions, helping to foster a range of opportunities and activities. 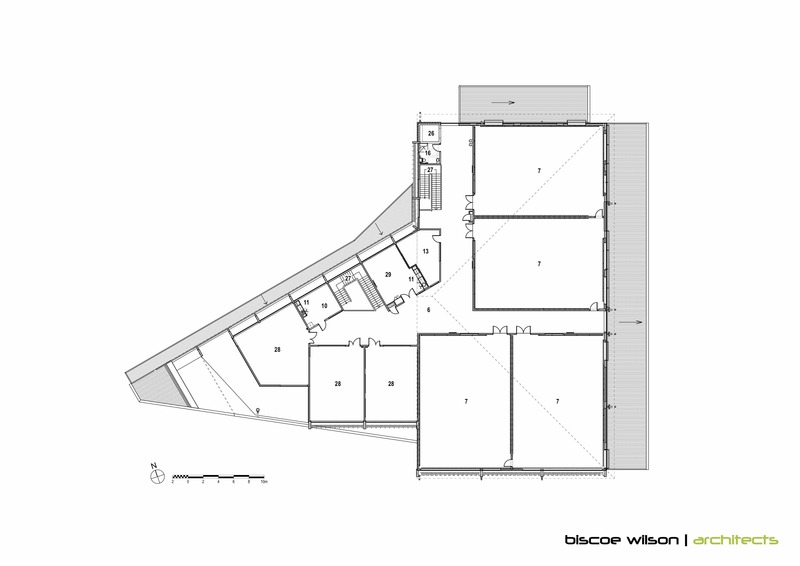 [15.03.2019] Concept images and partially complete photos of this new inner-city renovation by Biscoe Wilson Architects. 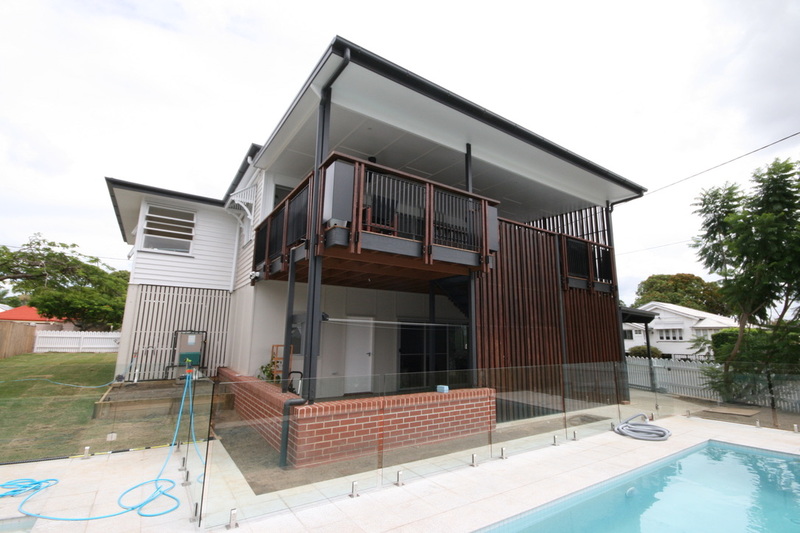 Biscoe Wilson Architects worked closely with the client to transform this Queenslander house into a dream home, complete with a backyard pool and generous back deck. 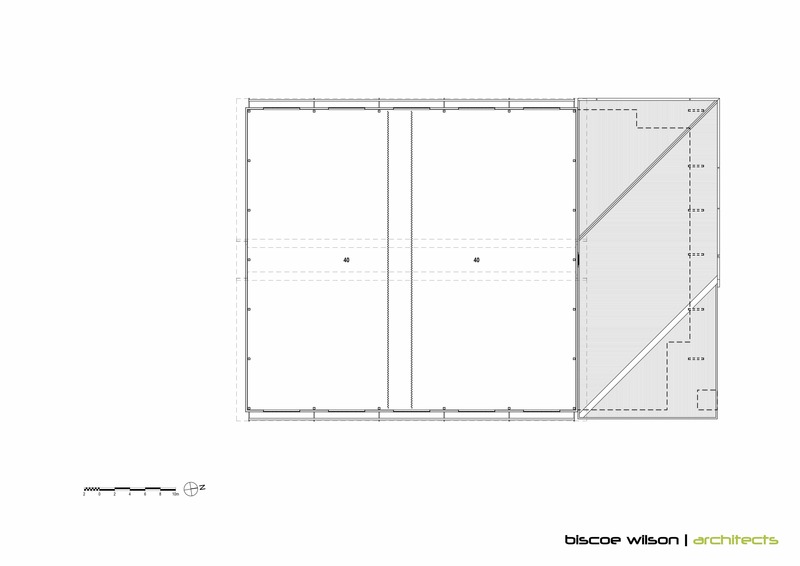 The final pieces are being put together, and we’re all looking forward to the final reveal. 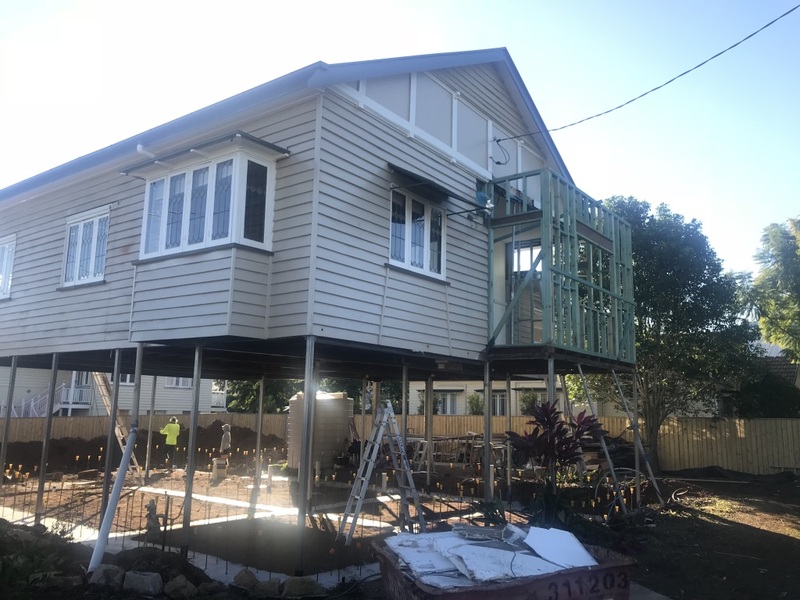 [June 2018] The house has been lifted and work is well underway. 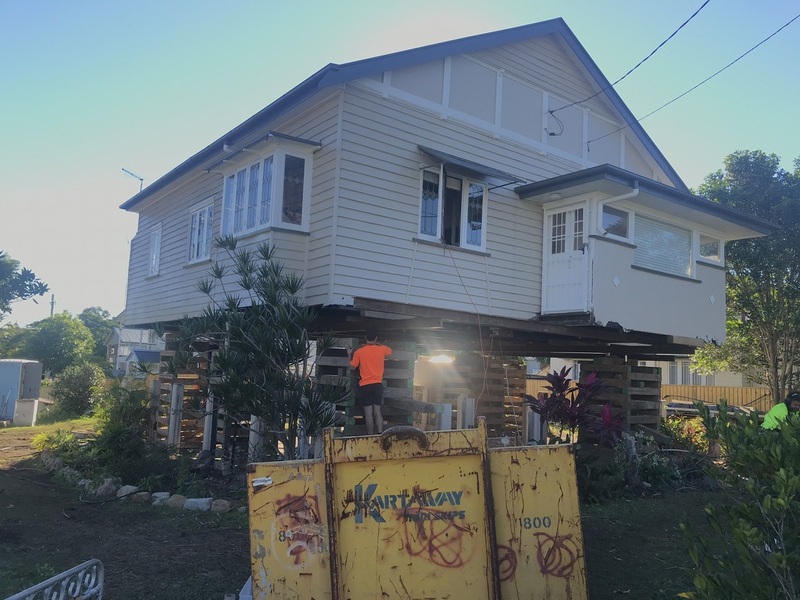 [June 2018] Lifting the house. 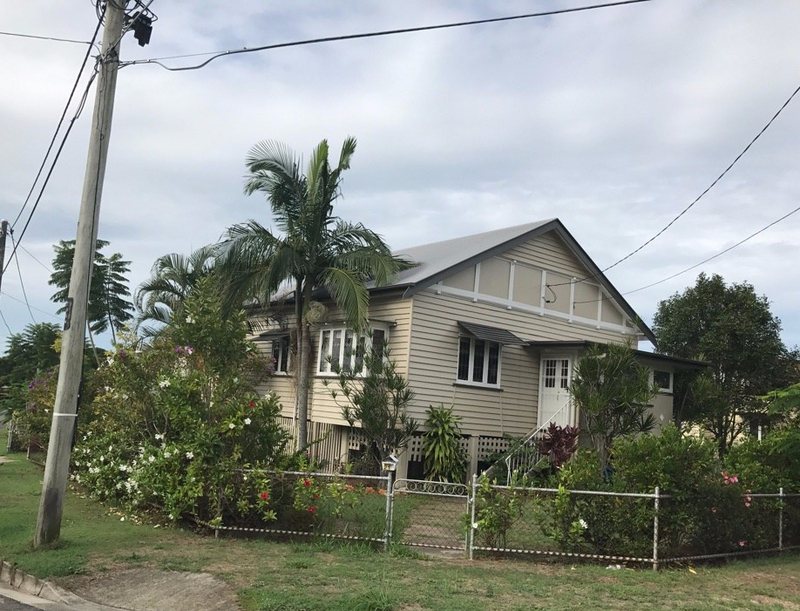 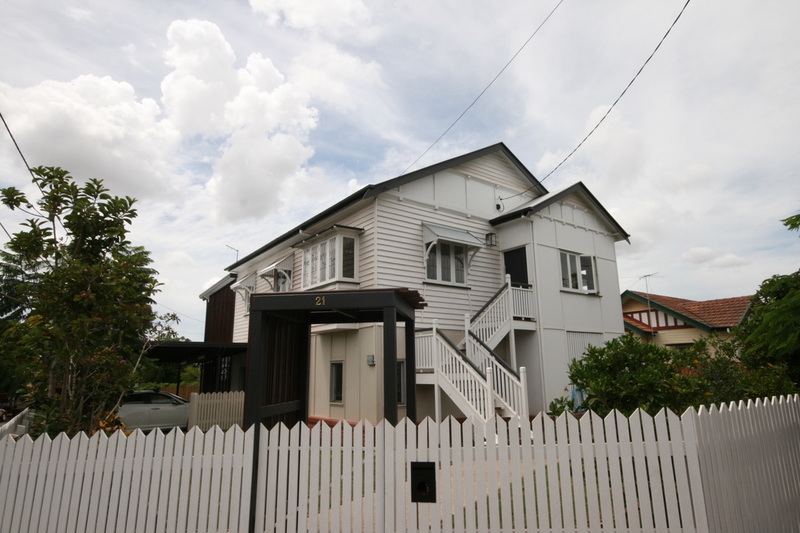 [March 2017] The existing Queenslander was very charming. 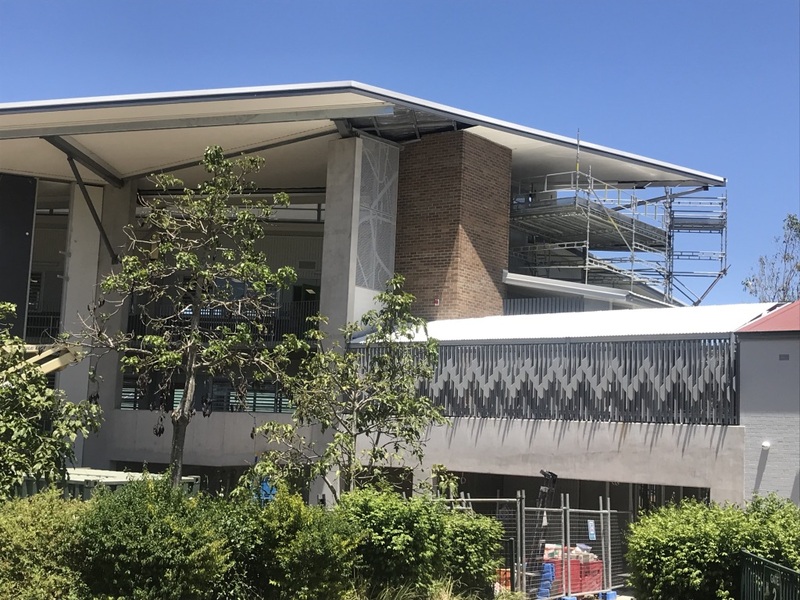 [15.03.2019] The Gap State High Sschool’s new Senior Learning Centre (SLC) will accommodate the school’s increased capacity, particularly introducing new dedicated STEM facilities. 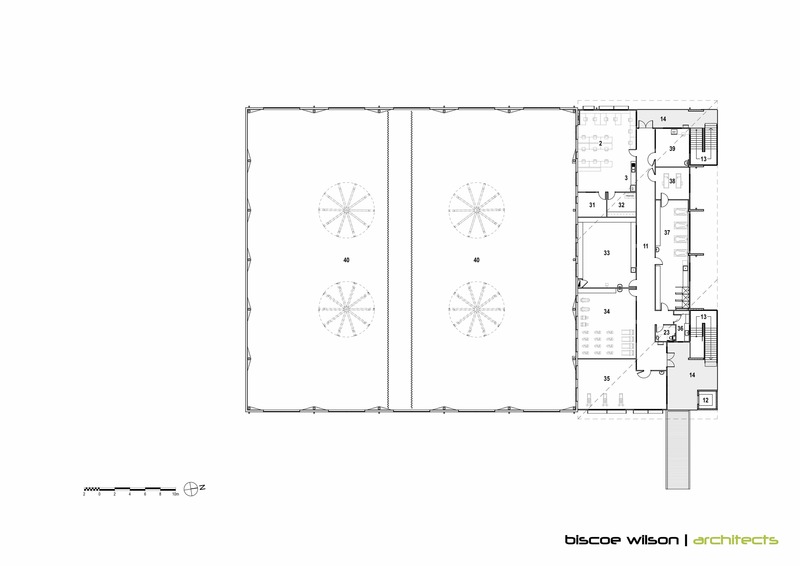 STEM (science, technology, English and math) facilities were briefed by the Department of Education, but Biscoe Wilson Architects saw a unique opportunity to extend the brief to include built art. 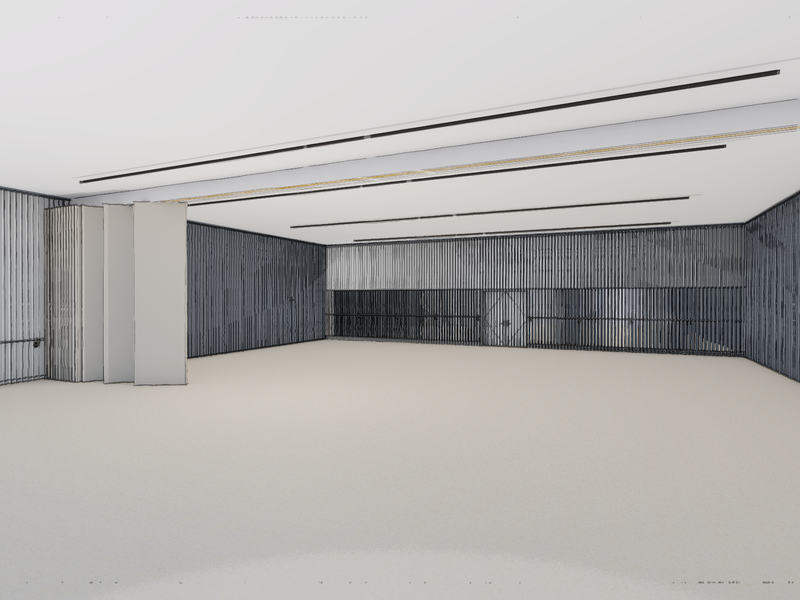 We collaborated with local Brisbane artist Glen Henderson, who spent her youth in the Gap. 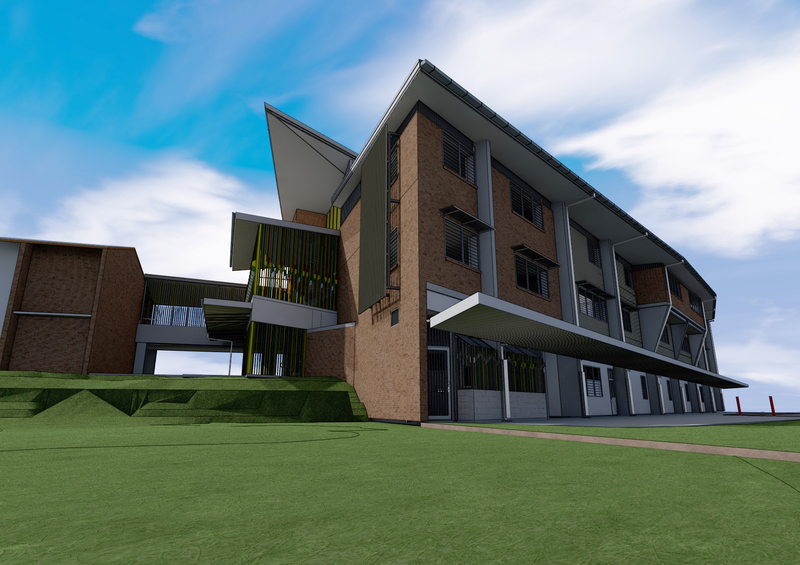 Glen’s unique artwork combines art and science, complimenting the school’s aspirations for the building. 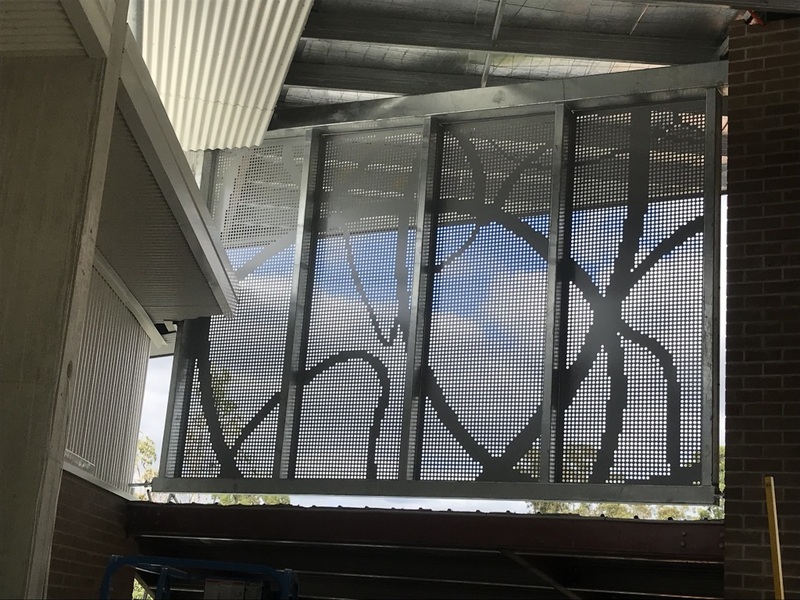 Glen’s artwork was incorporated into the motifs in the perforated metal screens, glass operable walls and concrete. 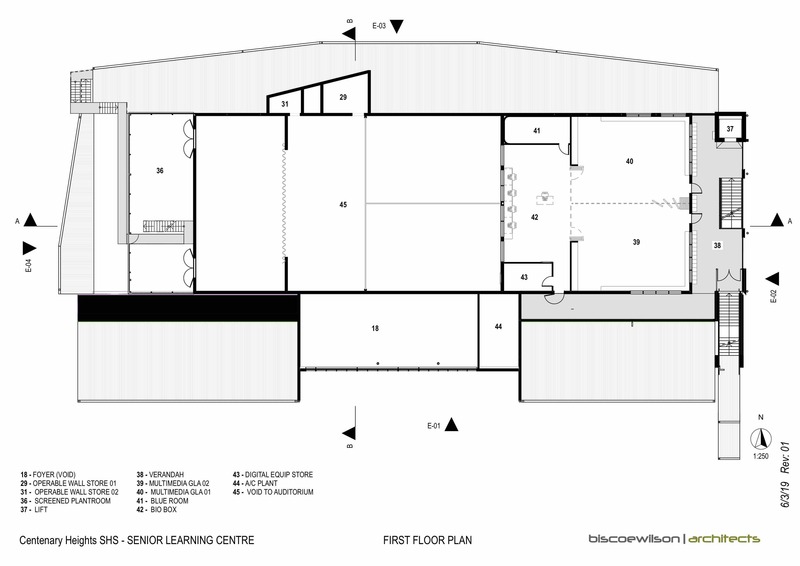 We believe incorporating built-in art that supports the educational function of the building will also support the students in their learning outcomes. 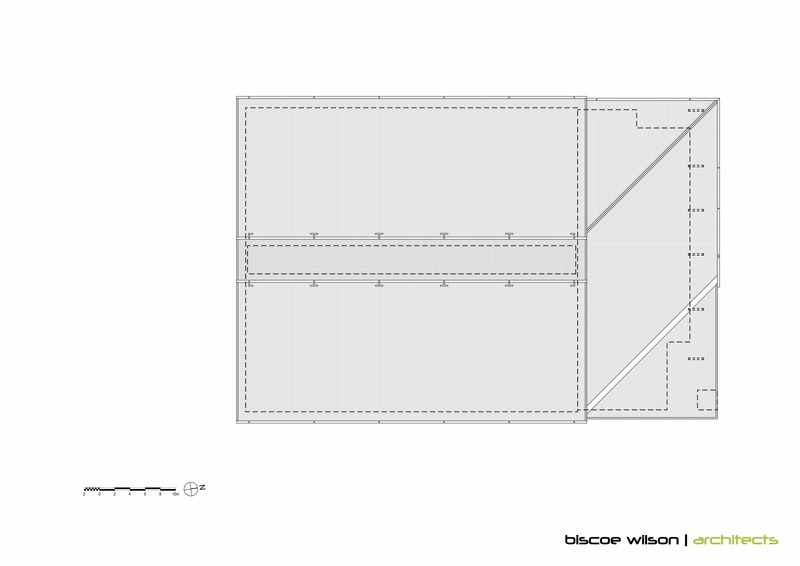 Glen Henderson’s artwork and their integration into the new building’s architectural motifs. 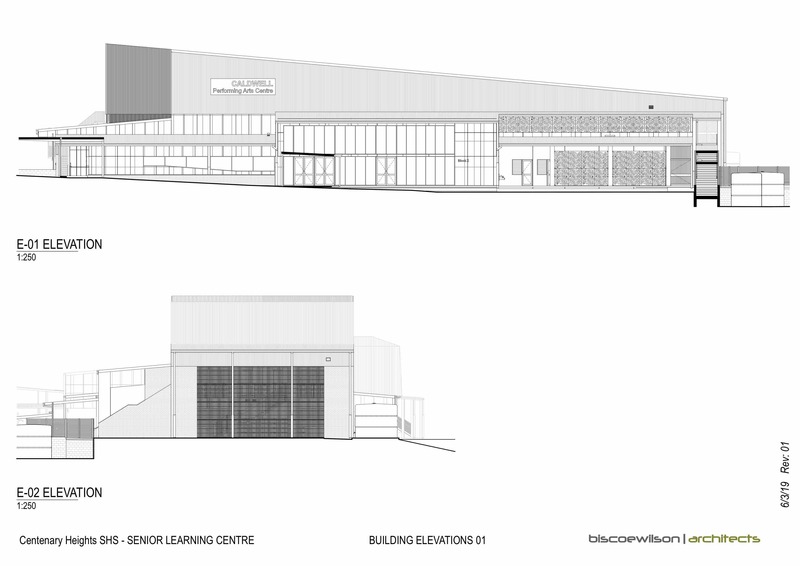 The new building is located on the edge of the school, adjacent to the carpark and busy Waterworks Road. 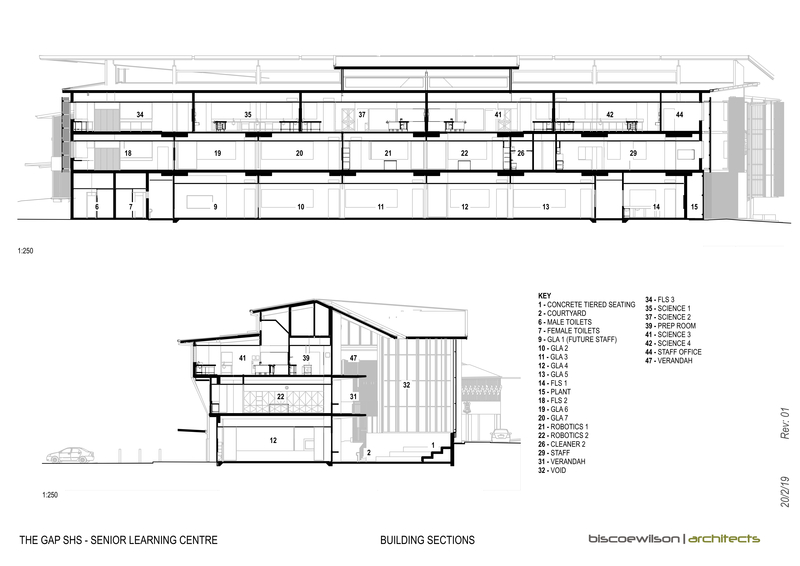 The building’s amphitheatre faces the road, buffering the classrooms and other facilities. 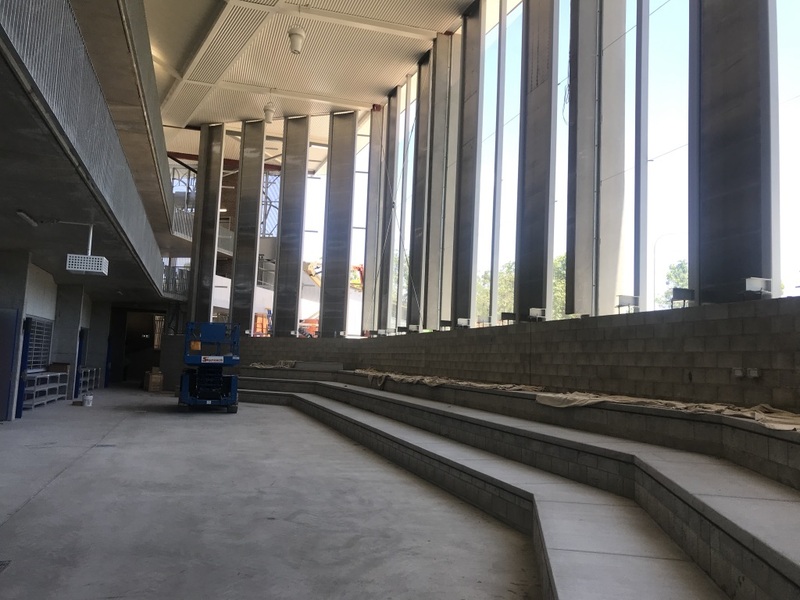 By roofing and enclosing the amphitheatre with a glazed acoustic art wall, an additional generous learning space has been created. 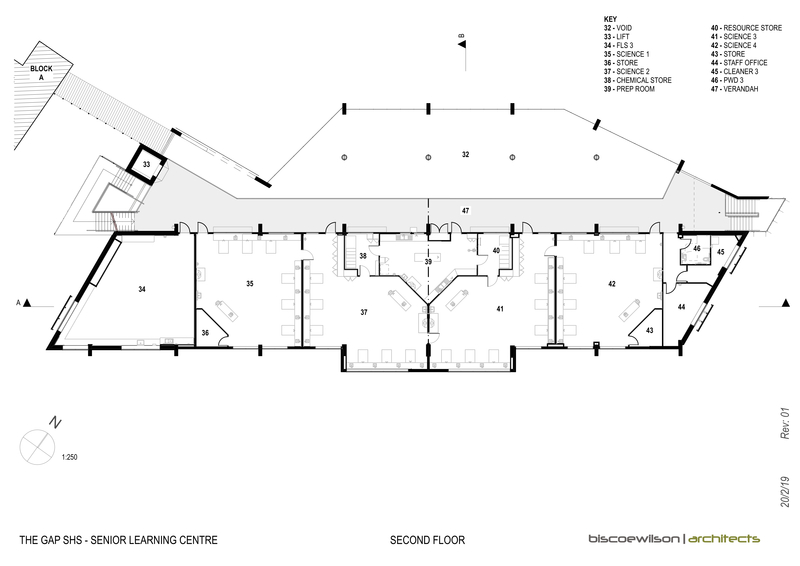 We believe that learning spaces can inspire staff and students, encouraging good learning outcomes. 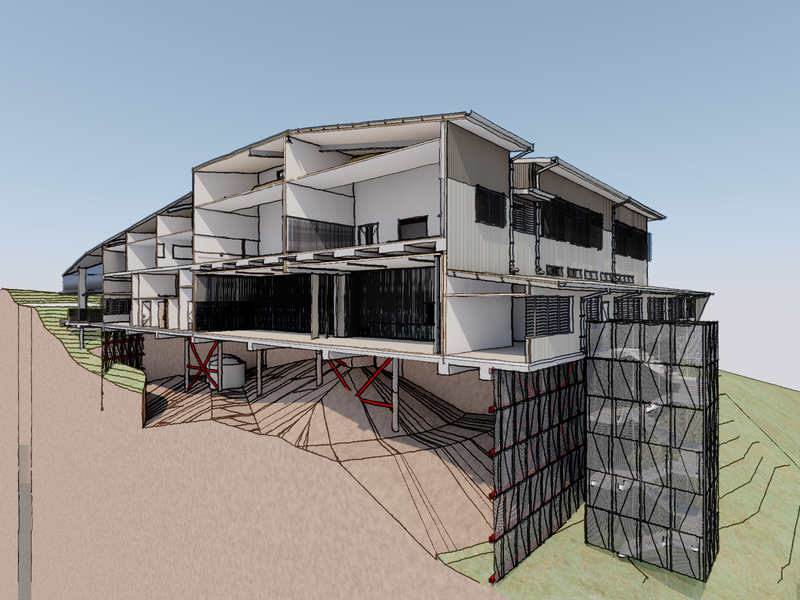 We worked closely with Farr Engineers to develop a structural system that would enable rapid construction. 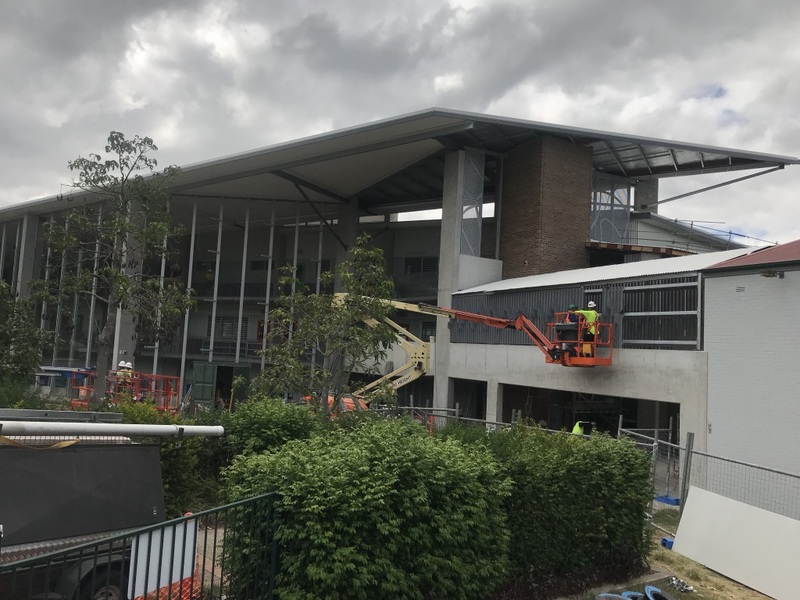 The hybrid precast and insitu concrete columns with post tensioned concrete suspended floors enabled the main structure to be erected with minimal disruption to the school. 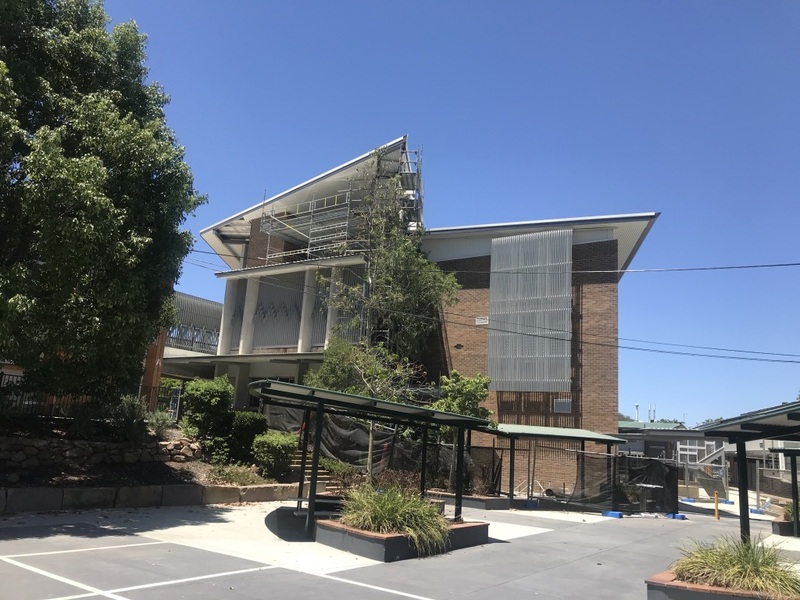 The external cladding comprised of painted exotec sheeting to externally accessible areas, and Colorbond Premier 300/ Spandeck to non-accessible areas. 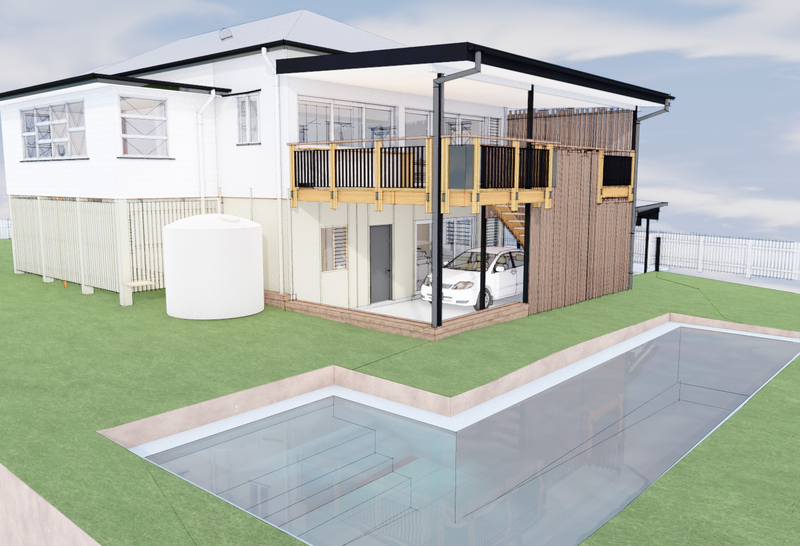 These materials were chosen for their durability and low maintenance. 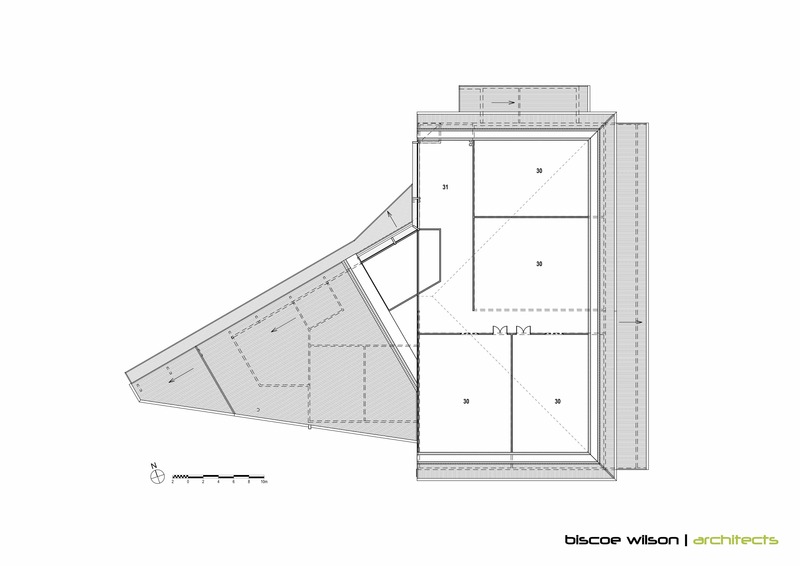 Biscoe Wilson Architects have experience designing on steep, landlocked and tightly constricted sites to create a functional and innovative solution which maximises the school’s potential. 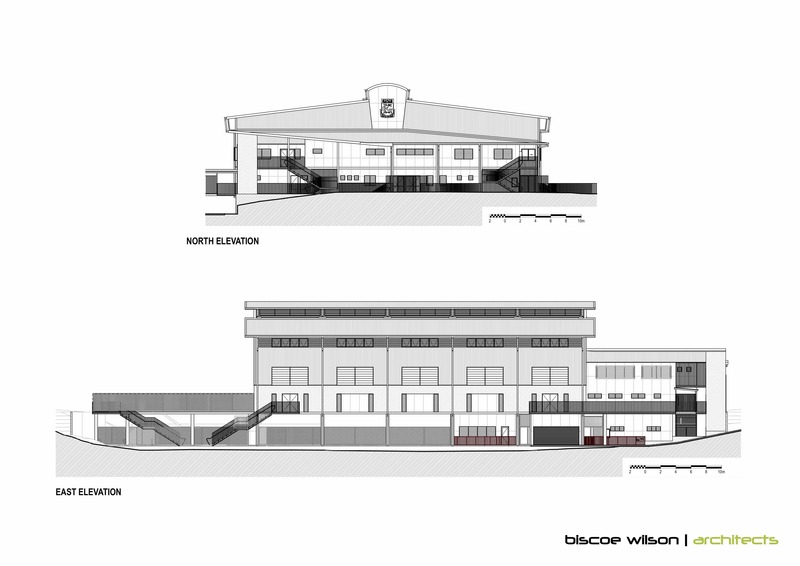 [01.03.2019] Drawings for The Gap SHS SLC. 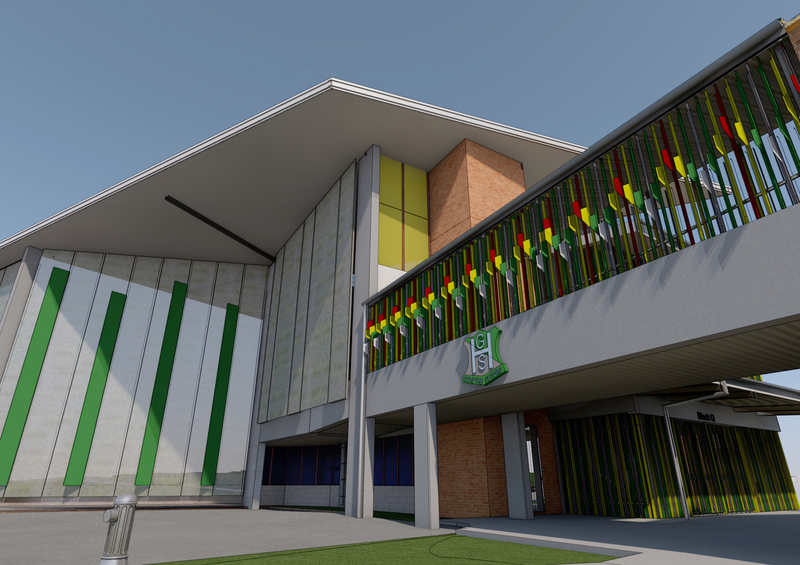 [29.01.2019] The Gap State High School Student Learning Centre is currently in construction. 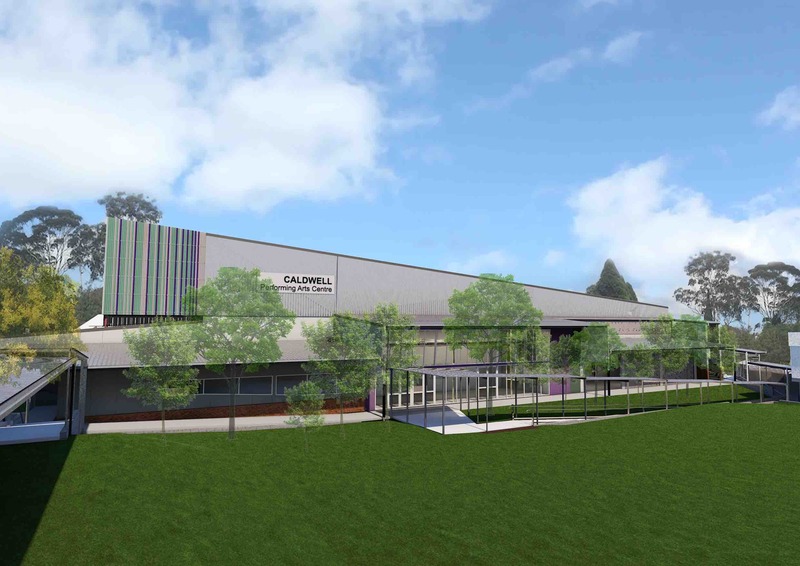 The Gap State High School’s new student learning centre will feature 7 general learning areas (GLAs), specialist science spaces, staff facilities and amenities. 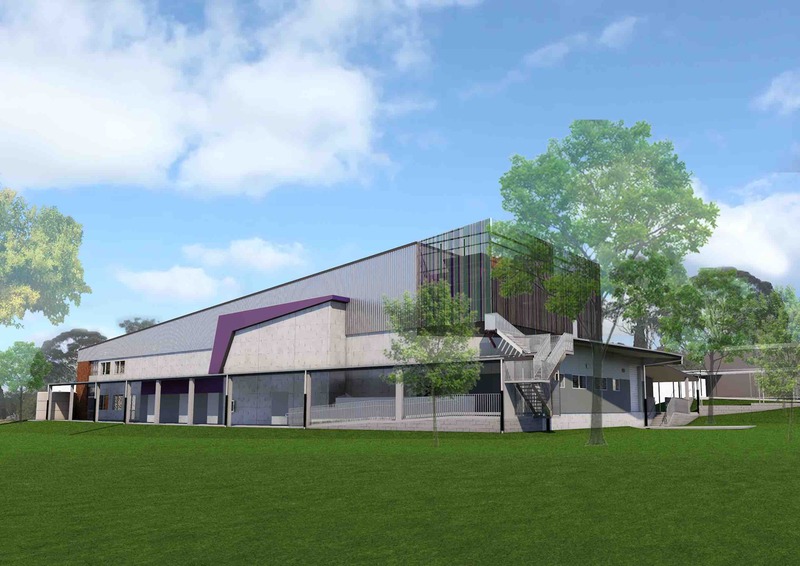 Mt Gravatt State High School’s new senior learning centre will feature general learning areas and specialised dance spaces.